Qasim Nanotavi ki Kitab ... Tahzir Un Naas mein Awla bamana aqrab heh ... google images mein tahzir un naas type keren un mein say aik hoga. Muslims believe Prophet (sallallahu alayhi wa aalihi was’sallam) is Hadhir Nazir. The opponents of Islam assume that Muslims believe Prophet (sallallahu alayhi wa aalihi was’sallam) is Hadhir as well as Nazir on every spec of Earth. And this misconception has lead the opponents to present few rational arguments as refutation of Hadhri Nazir without even realising their argument does not apply to Islamic belief. So objective of this article is to explain what Hadhir Nazir mean and how Hadhir Nazir is to be understood. Hadhir Nazir is employed instead of Shahid (i.e. witness). Hadhir is linguistically means present and means presence with a body, in line with creation’s characteristic – i.e. material and dimensions. Hadhir when it referrs to Jism (i.e. body) of RasoolAllah (sallallahua layhi wa aalihi was’sallam) then it is in literal/linguistical meanings – present with clay body. When it referrs to Ruh (i.e. soul) of RasoolAllah (sallallahu alayhi wa aalihi was’sallam) then it referrs to presence of Ruh with material which Ruh is made (i.e. Noor). Nazir means seeing and it referrs to seeing of eyes. When Nazir is used for bodily eyes of Prophet (sallallahu alayhi wa aalihi was’sallam) then it is referring to sight dependent upon sunlight. When it is used for Rooh of RasoolAllah (sallallahu alayhi wa aalihi was’sallam) then it is not it is not literal/lingustical but spiritual sight and this sight is dependent upon Noor from Allah (subhanahu wa ta’ala) and not sunlight. Also bare in mind Shahid is inclusive of hearing and even though hearing is not indicated linguisitcally in words Hadhir Nazir hearing should be implied by default. In context of Prophet (sallallahu alayhi wa aalihi was’sallam) supernatural and natural hearing of Jism (i.e. body) and Rooh (i.e. soul). A person is Hadhir as far as his hands can reach and on the spot he is standing, or sitting, or resting on but he is Nazir at ranges beyond his physical reach. Therefore it would be accurate to say person is Hadhir in a place but Nazir as far his vision reaches or he can hear. Consider radar as an example it is present in a place – suppose Manchester Airport - yet it can track planes which are hundreds of miles from its physical location – suppose – France, Germany, and Spain. Even though the radar may not be at the place where the plane is currently flying but its capability of tracking the plane miles away would make it a ‘witness’. Witness in the sense; the information acquired from it will be trusted and will be used to make judgments for air traffic. Just as a actual witnesses testimony would be relied upon to make a judgment in court. Point is that a witness does not need to, and is not Hadhir, in every place with body. Rather being in close proximity to the event, or being in a position from where one can see/hear the events unfold is sufficient to be witness. And within limited capacity all living and hearing/seeing creatures are Hadhir Nazir (i.e. witness). In context of Prophet (sallallahu alayhi wa aalihi was’sallam) it means Prophet (sallallahu alayhi wa aalihi wa’sallam) is Hadhir where his body/soul is Hadhir and Nazir/Sami as far as he can see and hear. In context of belief of Hadhir Nazir this translates to; Prophet (sallallahu alayhi wa aalihi was’sallam) witnessing (i.e. seeing, and hearing) of good/bad deeds of all nations before his birth and witnessing of good/bad deeds of Muslim Ummah and Jinn/Mankind. For details please see following article; here. Linguistic meaning of Hadhir Nazir is present and observing. It is derivative of Shahid/Shaheed (i.e. witness) hence it would be inclusive of hearing. Hadhir Nazir have different meanings depending upon what it referrs to. It is not essential for a Hadhir Nazir (i.e. witness) to be Hadhir at every where with body. Rather presence at a location and observing the event unfold would be suffient to fullfill the criteria of a witness. Implication of which is that Prophet (sallallahu alayhi wa aalihi was’sallam) does not need to be present physically/spiritually all over the earth rather he can witness the deeds being at a location. Typically it is assumed that Muslims believe Prophet (sallallahu alayhi wa aalihi was’sallam) to be Hadhir Nazir with jismani (i.e. bodily) sense. But reality is Ahlus Sunnah believe him to be Hadhir Nazir in number of ways. And this article will shed some light on the details. Hadhir Nazir is another way of saying witness. Every kamil (i.e. perfect) witness in essences and attributes is Hadhir (i.e. present), Nazir (i.e. observing) and hearing. There are four ways in which Prophet (sallallahu alayhi wa aalihi was’sallam) is believed to be Hadhir Nazir: i) Nooraniyyah, ii) Roohaniyyah, iii) and Jismaniyyah. Nooraniyyah and Roohaniyyah involve continously witnessing deeds before and after birth. Jismaniyyah is connected with witnessing of the deeds by Prophet (sallallahu alayhi wa aalihi was’sallam) around him and supernaturally witnessing deeds of all of his Ummat to come till the day of judgment. Nooraniyyah, for lack of better word, means LIGHT. Please note, every Noor is visible light. Angels are Noor but not visible light and they are a form of light which cannot be detected and will never be detected with instruments. Nooraniyyah is referring to Haqiqat al-Muhammadiyyah – the reality of Prophet Muhammad (sallallahu alayhi wa aalihi was’sallam) – which according to scholars of Ahlus Sunnah and Hadith is; Noor of Prophet (sallallahu alayhi wa aalihi was’sallam) was the first creation created by Allah (subhanahu wa ta’ala). It was divided into four parts one was kept and other three were used to create the remaining creation. And in this sense the living and the dead matter [dead from our perception of life but in reality it is also alive and worships Allah subhanahu wa ta’ala] are all connected with their source [the Noor from where they were seperated]. Ulamah explain just as a limb is connected with body and body/soul knows what the limb does in the similar sense Prophet (sallallahu alayhi wa aalihi was’sallam) is connected with the creation and he was/is aware of actions of Jinn and mankind. As well as all the happenings in the universe. Jismaniyyah referrs to body (i.e. jism) of Prophet (sallallahu alayhi wa aalihi was’sallam) and is related to his earthly life. There are two types of witnessing: i) Natural, ii) and supernatural. Natural witnessing is seeing with eyes hearing with ears of events which take place around the person. Supernatural, as evidenced by Ahadith, is seeing all the good/bad actions of his entire Muslim Ummah during in his life time. Roohaniyyah is related to Ruh (i.e. soul) of Prophet (sallallahu alayhi wa aalihi was’sallam). It has two components: i) Before birth, ii) and after death. First -: Soul of Prophet (sallallahu alayhi wa aalihi was’sallam) existed after its creation and it observed the good/bad actions of all nations before birth of Prophet (sallallahu alayhi wa aalihi was’sallam). Allah (subhanahu wa ta’ala) while adressing Prophet (sallallahu alayhi wa aalihi was’sallam) about past events questions: Have you not seen? Did you not see? Ulamah have explained this is because soul of Prophet (sallallahu alayhi wa aalihi was’sallam) has seen good/bad actions of nations before his birth. And Allah (subhanahu wa ta’ala) refferences so Prophet (sallallahu alayhi wa aalihi was’sallam) can recall events so he can closely relate the verses to events which the verses referr to. Second -: It involves observing the deeds iia) of believing Ummah iib) and Ummah to which he was sent to guide – i.e. mankind. In the case of (iia) Rooh of Prophet (sallallahu alayhi wa aalihi was’sallam) without middle observes good/bad deeds and as evidenced by Ahadith angels also present to him good/bad deeds of his Ummah after his departure from earth. With regards to (iib) Prophet (sallallahu alayhi wa aalihi was’sallam) directly observes their good/bad deeds [just like the first group] because he has been sent to mankind as a witness (i.e. Shahid/Shaheed) which nessceiates witnessing of good/bad actions to be a truthful witness. Prophet (sallallahu alayhi wa aalihi was’sallam) is believed to be witness (i.e. Hadhir Nazir) over the actions of Jinn and mankind in three ways. Nooraniyyah is connected with being personally aware of deeds of mankind as one is aware of one’s limbs. Roohaniyyah is connected with witnessing of soul of Prophet (sallallahu alayhi wa aalihi was’sallam) of events before and after his birth and death. And Jismaniyyah is related to earthly life of Prophet (sallallahu alayhi wa aalihi was’sallam) where he ordinarily and supernaturally witnessed the good/bad deeds of his Ummah. Note the evidences for each is different and if Allah (subhanahu wa ta’ala) wills all three categories will be explained in light of relating evidences. Aqeedah of Hadhir Nazir is a disputed subject amongst the various factions of Muslims. A group of Muslims believe it is fully in accordance with teaching of Quran and Sunnah. The disbeleiving faction holds to position that it is against teaching of Quran/Sunnah and to believe in Hadhir Nazir is Kufr and major Shirk. And their this judgment is extremism and it only invalidates their own Islam. If Allah (subhanahu wa ta’ala) wills the legal rulings regarding disbeliever of Hadhir Nazir from Islamic perspective will be presented along side its status in Islamic theology. Allah (subhanahu wa ta’ala) has stated that Prophet Muhammad (sallallahu alayhi wa aalihi was’sallam) has been sent as Shahid (i.e. witness) in following verses: "O Prophet! Truly We have sent you as a Witness, a Bearer of Glad Tidings, and Warner." [Ref: 33:45] Fundamentally this verse means Prophet (sallallahu alayhi wa aalihi was’sallam) was sent as a hearing and seeing type of witness during his earthly life. And following verse without interpretative modifiers (i.e. other verses of Quran and Ahadith) fundamentally means Prophet (sallallahu alayhi wa aalihi was’sallam) was sent to people of his time as a hearing/seeing witness: "We have sent to you an apostle to be a witness concerning you, even as We sent an apostle to Pharaoh." [Ref: 73:15] In his earthly life’s context negating his hearing and seeing of his immediate surroundings would be Kufr. With interpretative modifiers these verses expand the hearing and seeing to Muslim Ummah and mankind. Fundamental requirement to be Muslim when these verses are quoted is to affirm hearing/seeing in limited sense. First and foremost it is important to point out that Hadhir Nazir related to Fadhail (i.e. merits) of RasoolAllah (sallallahu alayhi wa aalihi was’sallam) and it is established by Zanni evidences. It is principle of Muhaditheen to employ Daif (i.e. weak) Ahadith for Fadhail along side fair and authentic Ahadith. 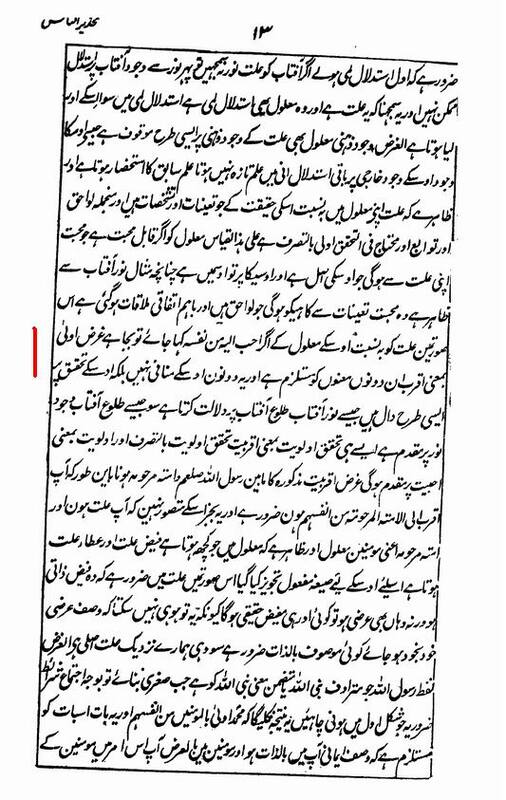 And this is not to say that Hadhir Nazir is established from Daif Ahadith. Rather to point out that in principle even Daif Ahadith can be used. As such it is not part of fundamental creed and it is not from essentials of Islam. Therefore rejection of Hadhir Nazir will not expel a disbeliever from Islam. But it is established soundly and it is deemed valid teaching/belief by Jamhoor (i.e. majority) of Ummah regarding which Prophet (sallallahu alayhi wa aalihi was’sallam) said: “Abu Dhār (Allah be pleased with him) reported from the Prophet (Peace be upon him) that, “Two are better than one, and three better than two; so stick to the Jama'ah for verily Allah, Most Great and Glorious, will only unite my Ummah on guidance." [Ref: M.I.Ahmad, Al-Ansar, Abu Zar Al Ghaffari, H20776] “Anas bin Malik said: “I heard the Messenger of Allah say: ‘My Ummah will not unite on misguidance, so if you see them differing, follow the great majority.’” [Ref: Ibn Majah, B36, H3950] These two Ahadith instruct the Muslims to follow the majority. Therefore by virtue of majority holding to this belief of Hadhir Nazir it is further strenthened. And this majority is of Ahlus Sunnah Wal Jammah (i.e. people of Prophetic Sunnah and of group). And rejection of it therefore will lead to misguidance and expulsion Jammah into heresy. Belief that Prophet (sallallahu alayhi wa aalihi was’sallam) is hearing and seeing witness and had witnessed events (i.e. deeds) that had taken place before his birth. And continues to oberserve the deeds of Muslims and mankind is established from Zanni and Tafsiri evidences as such rejection of it is not Kufr and does not invalidate Islam of an individual who dispbelieves in it. But Prophet (sallallahu alayhi wa aalihi was’sallam) being sent as a witness means he was hearing and seeing the events taking place around him. Rejection of this results in natural meaning of being sent as Shahid and therefore it is Kufr and it would invalidate beliefe in Islam.